Yorkshire - I Say Ding Dong Shop - Buy Stickers, Decals & Unique Automobilia. Bridlington Travel Pennant Sticker. 4". Harrogate Scroll Style Travel Sticker. 3.5". People's Republic of Yorkshire White Rose Circular Sticker. 4". Scarborough Travel Pennant Sticker. 4". Whitby North Yorkshire Travel Pennant Sticker. 4". 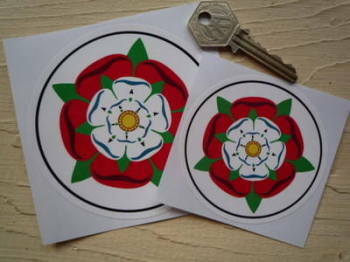 Yorkshire White Rose Circular Sticker. 3" or 4". Yorkshire White Rose Circular Window Sticker. 4". 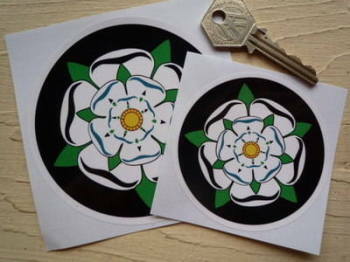 Yorkshire White Rose Shaped Stickers. 1" Pair. 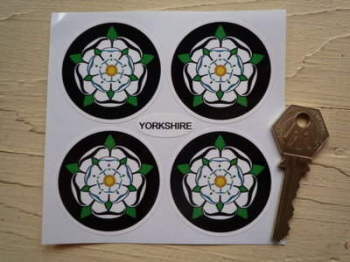 Yorkshire White Rose Wheel Centre Style Stickers. Set of 4. 50mm.